Awards celebrating the life-saving and life-changing work of staff in critical control rooms are returning for the second year. The APD Control Room Awards 2019 are the only national awards that recognise the extraordinary and selfless contribution to the public and society as a whole of people working in control rooms for the police, fire, ambulance and emergency rescue services, as well as the aviation and transportation sectors. The launch of the 2019 awards follow the success of the inaugural event earlier this year when, on an evening of high emotion, individuals and teams were recognised for demonstrating remarkable skill, professionalism and resilience in responding to crisis situations. ·London Fire Brigade’s Two Watch control room team for their calm and collected response to the Grenfell Tower inferno, which helped many people to escape the burning building. And Jules Lockett, from London Ambulance Service, for her outstanding work, including supporting the mental wellbeing of staff and breaking down the stigma around mental health within the emergency services. The APD Control Room Awards are run by APD Communications, which develops critical, life-saving software used by the police and other emergency services organisations across the country, as well as transport and aviation operators nationally and internationally. David David (Edd) Redwood, of Cornwall Fire and Rescue Service, was among the 2018 Control Room Awards winners for his role in the multi-agency management of a flash flooding situation and for helping to save the life of an elderly woman trapped in rapidly-rising floodwater. Entries for the 2019 awards are now open, with the awards ceremony confirmed for Thursday, March 7, 2019, at the De Vere Orchard Hotel in Nottingham when finalists and guests will enjoy an evening of celebration, reward and recognition. The cost of shortlisted nominees’ tickets will be covered, making it possible for all finalists to attend. The launch of the APD Control Room Awards 2019 comes hot on the heels of the success of International Control Room Week. Spearheaded by APD, the week saw thousands of control room staff join together in an extraordinary celebration of their work as the behind-the-scenes heroes of the emergency services. Following the positivity generated by the week, control room organisations and call handlers are now urged to nominate outstanding individuals and teams for the awards. APD Managing Director Mike Isherwood said: “Because of our work providing technology that supports and connects emergency services organisations and their control rooms we’re very well aware of the amazing work of staff in these operations and the vital service they provide to members of the public. “However, because their work is behind the scenes, it is largely unseen and sometimes under-appreciated. That’s why we felt there was a need to recognise and celebrate outstanding performance and achievement in critical control rooms the length and breadth of the country. “We thought the awards would be well received, but we were bowled over by the response and the stories of incredible dedication, professionalism and resilience they unearthed. 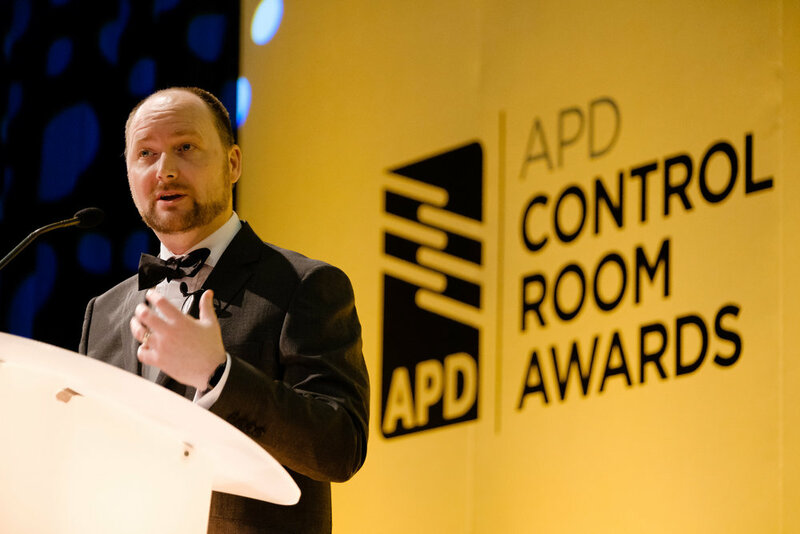 APD Managing Director Mike Isherwood speaking at last year’s inaugural Control Room Awards. Once again leading technology provider telent Technology Services will be the Platinum Partner of the awards. telent specialises in the effective operation of critical national infrastructure and is at the heart of many of the UK and Ireland’s best-known brands. It has long-standing relationships providing frontline operational technology solutions to Police, Fire, Ambulance, Maritime Coastguard Agency, RNLI and public safety organisations across the UK and Ireland. In addition, telent also operates within various other industry sectors including Rail, Traffic, Defence, Service Providers, Enterprise and the Public Sector. Barry Zielinski, telent’s General Manager, Public Safety & Defence, said: “At telent we have a long history providing and supporting mission-critical technology, including control room solutions, for the UK’s emergency services. “I was personally delighted that telent was a Platinum Sponsor of the inaugural APD Control Room Awards and it is an absolute privilege to continue our support into 2019. The awards evening was a fantastic celebration and a very emotional recognition of the incredible work and commitment of control room staff from all fields of the emergency services. The return of the APD Control Room Awards has also been applauded by British APCO, the leading UK-based association for everybody who uses public safety communications and IT, which will promote and publicise the awards. Ian Thompson, Chief Executive of British APCO, said the awards performed an important role in recognising people working in highly-pressured critical control room environments, dealing with a huge number of incidents on a daily basis. He added: “APD alongside its partner, telent, did a great job in launching and promoting the first Control Room Awards in 2018. The number and quality of nominations received showed the desire to acknowledge these unsung heroes and the tremendous work they do. Control room staff enjoy the hospitality before the 2018 Control Room Awards. The awards are returning for 2019, with the ceremony confirmed for March 7, 2019, at the De Vere Orchard Hotel in Nottingham. The John Gilhooly Unsung Hero Award, dedicated posthumously to John Gilhooly who served in the Scottish Ambulance Service control room for almost 30 years. You can nominate an unsung hero of the control room here. Don’t forget to follow the awards on Facebook, Twitter and LinkedIn.